The fall is a perfect time to design and order staff shirts or some other apparel. It helps create a team spirit, identifies students on campus, and reminds students to buy their yearbooks. It’s especially fun when the staff can sneak in a little theme humor that the general student body doesn’t quite understand. Last year the Prospect High School book used the “Polaroid” photo look in their book and used the same graphic on their staff sweatshirts. Of course no one on campus understood the connection until books were passed out in June. It’s always nice to put the students in charge of the design, like the student pictured below. Last year, a student at Cupertino Middle School had been learning how to silkscreen and actually hand-made every staff jackets! There are lots of well-priced vendors on the Internet (www.customink.com has a line of American-made shirts), but also give your neighborhood silkscreen store a call and keep your business local. 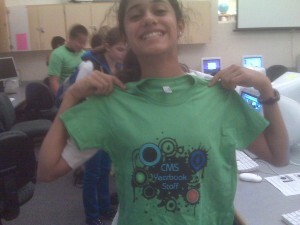 Yearbook staff tee shirts arrive!